Kadoorie Farm and Botanic Garden (KFBG) is situated on the northern slopes of Hong Kong’s highest mountain – Tai Mo Shan (957 metres). Within KFBG are streams, woodlands, orchards and vegetable terraces – together with conservation and education facilities. KFBG, today, is a unique public-private partnership, incorporated and designated as a conservation and education centre by Ordinance (Chapter 1156) in the Legislative Council of Hong Kong on 20th January, 1995. While KFBG is a public organisation, it is privately funded by the Kadoorie Foundation. Since 1995, KFBG has focused on promoting conservation and sustainable living in Hong Kong and South China, with programmes on flora and fauna conservation and the promotion of organic agricultural practices. KFBG’s mission statement is “We exist to increase the awareness of our relationship with the environment and bring about positive change in the world through conservation and education”. The project began in 2008 to pilot the combination of organic farming with a new agricultural technology. The agricultural technology was developed by Professor Lu Shihua. The process involves raising planting beds, using plastic sheeting and wider plant spacing. During 2006, the technology saw impressive results, producing a substantial crop, even during drought periods. 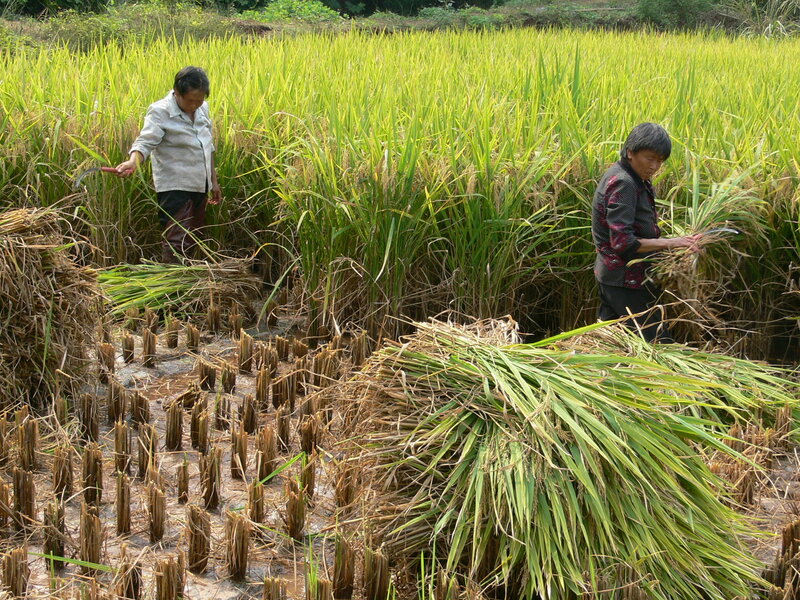 Kadoorie Conservation China (KCC) then sought to combine this method with organic farming practices to aid the agricultural issues China was facing, such as: inconsistent yield; an aging population and generally poor community health. • Provide more sustainable and profitable crop yields. • Improve the local agricultural community’s health and living environments. • Move agricultural process away from environmentally damaging methods and towards ‘greener’ and more sustainable techniques. These objectives are met through the combination of organic farming and Professor Lu Shihua’s technology. 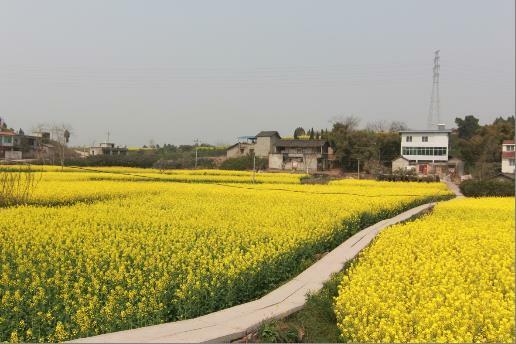 The project began by trailing the approach on a farm in Sichuan village. Whilst there the method produced astonishing yields that had never been seen before, this therefore encouraged other farms in the village to adopt the method. The success of the project is positive in terms of three key issues facing Chinese agriculture. Firstly, it addresses the need to move away from environmentally damaging process. Chemical fertilizers are used heavily in Chinese agriculture causing damage to the local environment and producing large amounts of CO2 emissions. The method provided by the project provides a ‘greener’ alternative that, not only, benefits the environment, by not relying on fertilizers, but also produces a greater yield for the farmer. The second issue that is addressed is the health of communities. Moving away from fertilizers is healthier for the local public. Furthermore, the process is less strenuous which helps the aging agricultural population. Lastly, the procedure produces a more stable yield even when facing climate change. The future for the project is very promising. Due to its success, neighbouring villages are converting their agricultural practices to the new method, 436,000 hectares have already been converted, and this is only envisaged to continue. There is also research being conducted into improving the technique further. Although the plastic used in the setup causes less impact on the environment then chemical fertilisers, there is currently investigation into whether the plastic could be removed from the process. Trials are being conducted to assess whether rice straw could be used to replace plastic so as to make rice production even “greener”. With 7.2 million residents in 1,104 km2, Hong Kong is one of the most crowded places on earth. Despite decades of urbanisation, 48% of Hong Kong’s territory has been designated as country parks to protect the environment and to provide an escape from urban life for city dwellers. Hong Kong’s primary forests were destroyed centuries ago and have not recovered since then, due to continued disturbance by humans, mainly by fire. The amount of extinct species is hard to assess since their disappearance pre-dates specimen collections, but probably has been in the hundreds. Only small patches of forest, most of them less than 5 ha in size, have been preserved by villagers for cultural reasons. These so called “feng shui” woods”, survived the destruction and remained, together with isolated shrubs and trees in rocky ravines, the only seed source of the local flora. Feng shui woods, some of them more than 400 years old, contain only parts of the original forest species composition, mostly made out of tropical and a few subtropical plant families. Local people have used the feng shui woods as forest gardens for centuries, altering the original forest structure and species composition by removing unwanted plants, felling trees for wood and artificially enriching the forest with edible and medicinal plants. Despite being modified over centuries these forests harbour an incredible diversity of plants, often hundreds of species per ha resulting altogether in a remarkable flora of 2175 native Hong Kong plant species, of which more than 400 are woody species. The feng shui woods constitute very nice examples of traditional agroforestry systems once common throughout South China. Only a few patches of high quality feng shui woods remain, mostly restricted to lowland areas, near villages, whereas most of Hong Kong’s natural landscapes are now covered by secondary grasslands and forests of different successional stages mostly established after World War II. Recent studies have shown that the oldest patches of secondary forest, which are around 70 years old, can harbour 174 species in 20 ha, still consisting of mainly early and mid-successional species. There is no evidence, that climax trees, which are still found scattered in feng shui woods, are able to recolonize the secondary forest. Probably the lack of suitable dispersal agents and unfavourable microclimatic conditions limit the number of species able to recruit in secondary vegetation. Generally the natural re-establishment of forest is a very slow process and follows the successional model, whereby grassland is replaced by shrubland and shrubland finally by forest. This process can take between 20 to hundreds of years in Hong Kong and certain exposed places with badly eroded soil seem incapable of recovery. Therefore from some 150 years ago when Hong Kong became a British colony, early attempts were made to reforest the “barren rock” Hong Kong. Originally only exotic trees were planted, whereas in the last decades more native species were added to the planted species mix. Results were heterogeneous, with some hardy exotic species such as Acacia ssp. or Eucalyptus ssp. were growing better than native species. Kadoorie Farm and Botanic Garden (KFBG) started to experiment with afforestation 60 years ago, when a barren hillside was selected as the gardens location along a stream, which never dried out in the seasonal climate. In the early days mainly agriculture and orchards were established and along the stream trees were planted and the forest was allowed to recover. When conservation became one of the focus areas of KFBG in the 1990’s an ecological restoration program was established by setting up a native tree nursery as a key facility. 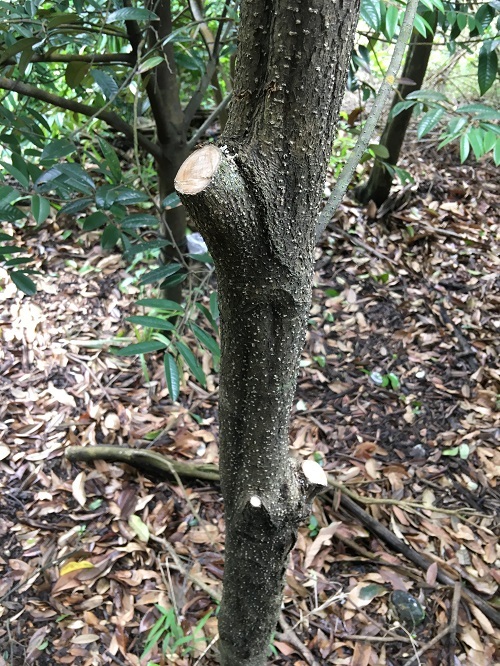 In collaboration with Hong Kong University (HKU) experiments were conducted to understand factors that limit the establishment and survival of native trees in grass- and shrublands. Much knowledge was gained about dispersal, recruitment, survival and growth rates of planted and naturally established tree species. Planting trials with native trees were successful and results were published over the last two decades (see publications by Richard Corlett and Billy Hau). Building on experience gained and the fact that it seemed impossible that the forest will recover naturally, in 2013 an ambitious restoration project on the upper slopes of KFBG’s premises called: “Ecological restoration of the original montane forest of Hong Kong” was established. The experience gained can, and hopefully will, be used for projects elsewhere in the South China Region. 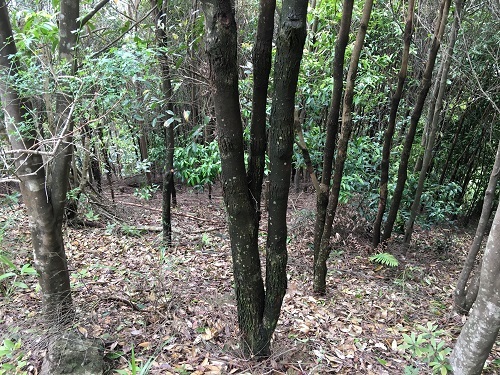 KFBG started the project by surveying remote ravines in Hong Kong to assess the candidate species for restoration but also comparisons were made with more mature forests in other parts of South China. 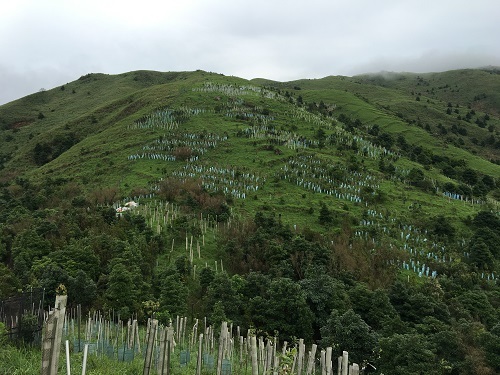 Forest monitoring plots were established to better understand natural patterns of succession, including a 20 ha forest dynamics plot in collaboration with HKU in Hong Kong’s only nature reserve. Unfortunately, KFBG were not able to identify any remaining primary or mature template forest with similar species composition and climatic conditions like the restoration site, but it was possible to estimate by comparison with similar vegetation types in the region that the original plant community would have had at least 150 woody species per ha. In order to be able to monitor the project from the first planted tree throughout the evolution of the forest, a 20 x 20 m grid was established over the total project area of 10 ha. Every planted tree and also every existing shrub and tree was identified and tagged with a unique number. Not all plots were planted as some act as monitoring plots for natural succession. Two automatic weather stations permanently monitor the climatic conditions remotely, allowing KFBG to link growth and survival rates to climatic patterns. One of the key questions of the project is whether it is possible to shortcut natural succession and avoid the shrub and early tree stages of succession by planting climax trees at the beginning of the ecological restoration process. To address this a series of experiments were established to overcome factors that reduce survival and growth rates of climax trees in an open grassland environment, such as strong wind, wind desiccation, strong sunshine, herbivory, competition by grasses for nutrients and water, soil erosion etc. The experiments included the use of different types of tree guards, different types of weeding mats, different types of fertilizers, soil amendments with compost and biochar and different weeding regimes. It was clear from the beginning that many of the questions which needed addressing were applied and mostly related to good horticulture rather than ecology. Early on it was found that protecting the trees with tree guards was very beneficial and allowed smaller seedling to be planted, thus reducing the risk of curled roots and reducing the nursery time and the amount of soil in the root ball. 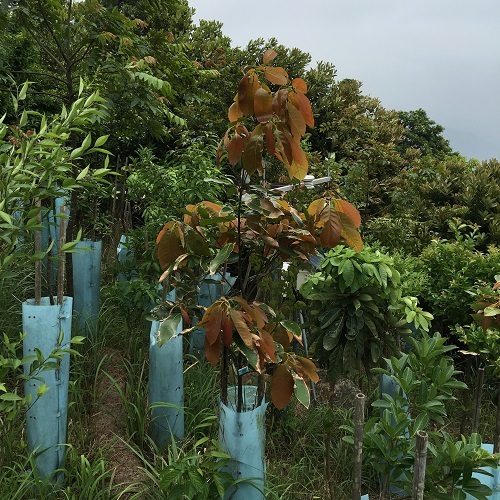 Tree guards also significantly helped to overcome many of the limiting climatic factors mentioned above and survival rates were drastically increased compared to zero controls without tree guards. In order to test the effect of treatments 20 different species were planted in a mixture of pioneer and climax trees and shrubs in plots replicated at a high frequency over the restoration site. To avoid low diversity plantings, it is important to thin the trees once the initial treatment questions have been answered. This is done after 3-4 years. The thinned trees are used for mulching and as erosion barriers along the contour lines. The gaps are filled up with additional species of trees and shrubs to increase the overall species diversity. Before planting, the height and basal diameter of all trees are measured and a census of each plot is conducted after the first 2 years and after that every 5 years. All the 20 x 20 m grid cells are alternately planted, always leaving one cell empty. Once the trees in the neighbouring plots have grown up to a least 4-5 meters in height, the climatic condition inside the empty plots are more favourable for rare and shade tolerant species. First results are very promising and currently more than a hundred different woody species have established in the core area of the restoration site. The experiments and strict monitoring regime in place allows a large amount of information to be gathered across a relatively small area and for recommendations to be made for future projects. For example, KFBG has learnt that good arboriculture is needed early on to make sure that rare climax trees grow straight, don’t branch too early and are free of competition so they are not outperformed in the stem exclusion phase of succession by overly vigorous pioneer trees. 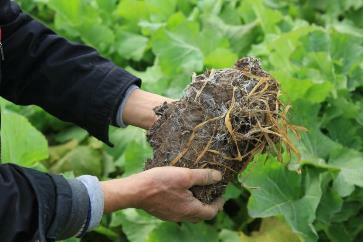 KFBG has tested whether very close planting can overcome these problems but unfortunately without success. Although little is still known about how plant species coexist and interact with each other in this particular ecosystem, KFBG restoration experiments will allow them to compare natural succession initiated by a limited species pool caused by massive deforestation in the past with succession initiated by an artificially increased species pool. This provides a unique opportunity to test hypotheses on community assembly, species coexistence, habitat preferences, environmental filtering in a phylogenetic, functional and ecological framework. These experiments are still on-going and KFBG plan to publish a series of scientific articles in the coming years to share the knowledge gained and guide restoration projects elsewhere. Please contact Gunter Fischer for more information about this project. For thousands of years, Chinese artists have drawn inspiration from their country’s rich and diverse landscape. Today, thanks to BGCI's support, their work is helping thousands of people understand how vibrant, unique and beautiful their country is – and how important it is to protect it.